Brain cancer growth. 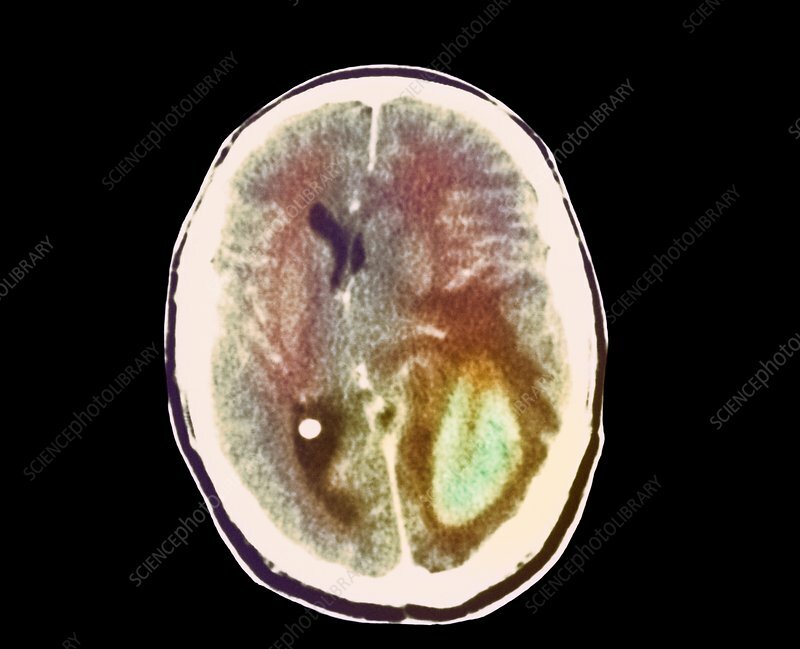 Coloured computed tomography (CT) scan in axial section through the head of a 38 year old man with a malignant, rapidly growing glioma brain tumour (green, lower right). This tumour was surgically reduced in size to ease pressue on the brain, but it recurred and increased in size in three weeks. A glioma is a common cancer arising from the supportive glial cells in the brain. Growth of the tumour distorts the surrounding structures of the brain, as seen here. Effects of this can include seizures, headaches, sensory disturbances and speech disorders. For this tumour before treatment, see image M134/494.